The Third Provincial Grand Principal Ian Higham was the principal guest of Morecambe Chapter No 1561, when they held their installation convocation at Morecambe Masonic Hall. Ian was supported on this occasion by Assistant to the Grand Principals Christopher Butterfield and grand officer John Robson. Also present were Provincial Deputy Grand Director of Ceremonies David Thomas and acting Provincial Grand Stewards Peter Pemberton and Chris Larder. Chris also happens to be the Lancaster and District Group Secretary. 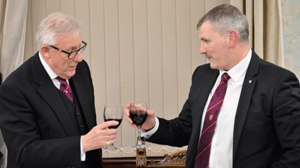 Ian Higham (left) toasting the first principal Craig Simpson. Taking the scarlet robe of first principal for the second successive year was Craig Simpson, the chair of second principal was taken by Stuart Bateson and the blue robe of third principal was donned by Geoff Willman. The robe addresses were delightfully delivered. The scarlet robe address was given by a past first principal of the chapter, Malcolm Brown, that to the second principal was by Andy McClements and Paul Birmingham gave the blue robe address to the third principal. At the close of the ceremony, Ian was very pleased to bring the greetings and best wishes of the Grand Superintendent Tony Harrison. Ian said that he was sure that Tony would have been extremely pleased with the quality of the proceedings and would have expressed his gratitude to those companions who had taken office this evening. The festive board held in the Morecambe Masonic Hall banqueting suite, enabled Ian to bring his own congratulations to all the companions, especially those who had undertaken to present the robe addresses, adding that it was nice to see upcoming companions taking a part in the ceremony. After thanking the grand and acting Provincial grand officers for their support, Ian moved on to update the companions on the current issues the Grand Superintendent wished to draw to their attention. Particular emphasis was paid to the MCF 2021 Festival and membership of the Craft and Royal Arch. Ian made mention of the need for all Masons to be outspoken about their Masonry and to be proud of it. The toast to the three principals was given in a most agreeable manner by another past first principal of the chapter, John Bates. At the festive board the raffle raised £145. Pictured from left to right, are: David Thomas, Chris Larder, John Robson, Ian Higham, Stuart Bateson, Craig Simpson, Geoff Willman, Christopher Butterfield and Peter Pemberton.